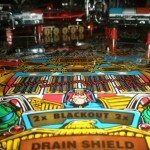 I recently bought a Judge Dredd and spent the last four days bringing it up to par. I’m publishing this list for future reference. 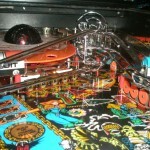 Stripped, cleaned and waxed playfield. 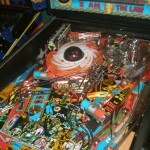 This hadn’t been done for awhile as there were grimy ball trails in the back orbits and the captive ball area. Polished all chrome ramps with fine steel wool. Cleaned and polished all plastic ramps with Novus 2. Cleaned and polished all plastics with Novus 2. Left plastic by upper left flipper was heated and flattened, then trimmed to fit flat again. Appeared to have been installed from the factory this way. Rear Deadworld plastic under deadworld heated and flattened. Left Black Out ramp mount near crane was repaired. Crane Adjustment: The bottom set screw was loose. Had to tighten it and set the crane in the right lateral position. Then, adjust crane height on another adjustment. Then, adjust deadworld disc position. Had to bend the crane forward because it didn’t reach. 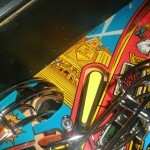 It probably got tweaked somewhere along the way by lifting the playfield and it catching the cabinet. Also installed right ramp cliffy protector. I found the upper left flipper bracket assembly was missing the four 4 (4 of 6) mounting screws and had about 1/2″ of vertical play. 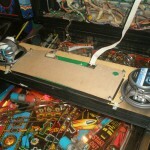 3 of the playfield screw holes were stripped, but I was able to use one size larger screw to fix it. 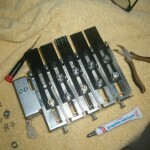 Adjusted all 4 EOS flipper switches. 1 leg bolt was found stripped and was replaced. Left kick out lane switch was coming on too early so it would kick the ball out kind of slow sometimes. The “J” and “E” drop targets were sticking. Removed and disassembled target assembly. Cleaned and lubed targets with graphite. Removed Black Out ramp guard at ramp entrance. Removed factory mylar by sniper tower and replaced with new mylar. 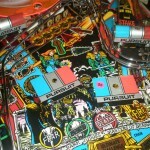 Removed factory mylar in outlanes and the bottom of all ramps and replaced with new mylar. 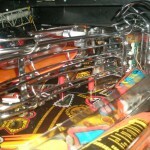 Installed mirror polished balls in captive ball area. 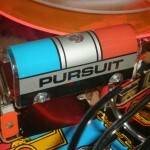 Installed Red and Blue LED flashers bulbs from Coin Taker in Pursuit assemblies. Installed Red Coin Take flasher LED in Deadworld. Installed correct color LED lights in Crime Scene Level inserts. Replaced yellowed white bulb and bulb covers in Crime Scene inserts with white LEDs. Installed ultra bright orange LED in Black Out Jackpot ramp. Installed white LED in Sniper Crosshair insert. Installed white LED in Advance Crime Scene insert. 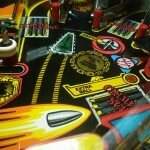 Installed black flipper rubber and slingshot rubber. 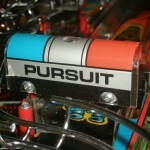 Kept white rubber behind drop targets for faster play. Removed and cleaned translite and translite glass. Removed speaker grill plastic and cleaned with Novus 2. Cut right side speaker panel hole to match left side and accommodate 5 1/4″ speaker. 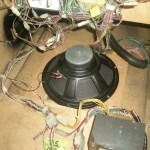 Installed new 5 1/4″ 3 way back box speakers. 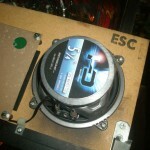 Installed 12″ sub woofer in cabinet that rocks! 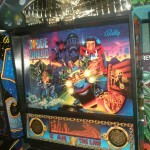 This entry was posted in Repairs, Mods & Shop Outs and tagged judge dredd, Williams by Pinball Shark. Bookmark the permalink.